SECONDS has developed and tested continuous driver support functions realised in four demonstrator vehicles. Therefore, input from other sub-projects was used: evaluation guidelines and a plan developed by Evaluation; the perception platform developed inside Perception, and the IWI strategies defined by the respective sub-project. interacts with the driver while drawing on the appropriate strategy as well as on safer or more efficient options. In this way, the co-driver system not only suggests how the human drivers could, but also how they should, drive. It takes into account the given situation, i.e. 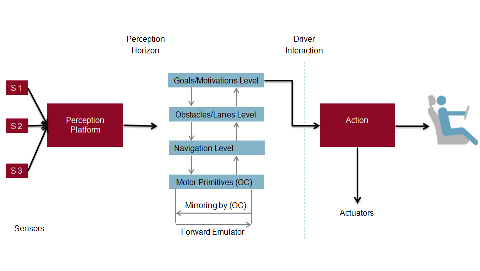 position of the vehicle, traffic flow and potential obstacles, and analyses the possible reaction schemes for further interaction with the driver via multiple channels with extensive use of haptic feedback and interaction on driver commands. Thus, the co-driver and the human driver form a ï¿½symbiotic systemï¿½. Mr. Saroldi, what is the specific task of your sub-project in interactIVe and what are the particular challenges of your work on driver support technologies? Andrea Saroldi: Inside interactIVe, the sub-project SECONDS is dedicated to prototyping and in-vehicle tests of the Continuous Support function. 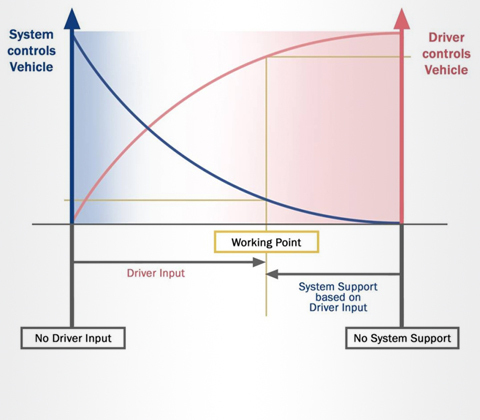 The goal is to conceive and implement a driver support function that is able to assist in many different situations with unified driver interaction interface. The idea behind that is of a driver companion that is usually silent but can advise or even intervene when there is a risk. In my opinion, the most challenging task here is to make technology ï¿½transparentï¿½: the drivers are not interested in sensor-data fusion or optimal manoeuvring planning; they just want to drive safely. This implies two guidelines for development: select the technologies that better fit the driver needs, and build a deep integration between the system modules, not just an overlap of different driving assistance functions. What difference will the developments in interactIVe make compared to existing technological solutions? How does the support look, sound, and feel like? Andrea Saroldi: First of all, as output from the sensor data processing part (called Perception Platform) we obtain a unified description of the scenario around the vehicle including all key elements: obstacles, road, and environment. This scenario description is used to generate an optimal manoeuvre that is the best manoeuvre to be followed as computed by the system, considering safety, comfort, and fuel consumption simultaneously. The optimal manoeuvre computed by the system is then compared with the actual manoeuvre executed by the driver. When there is a mismatch, the driver is prompted to change the trajectory with a strength that is increasing with the danger level. The most difficult development tasks are therefore related to obtaining an accurate description of the road scenario, a reliable optimal manoeuvre, and good strategies to invite the driver to follow it, also in dangerous situations. This deep integration between modules is a key new aspect of interactIVe. During 2010, in the first year of activity, SECONDS focused on the definition and specifications of the continuous support driver assistance function and how to realise it in the different demonstrator vehicles. The challenge inside SECONDS was to give continuous support to the driver in order to avoid entering into dangerous situations. It is pursued by giving early warnings and advices with the aid of multiple haptic channels of driver interaction able to communicate increasing risk level. In 2011 the real development activity has started with equipment of demonstrator vehicles, integration of components and implementation of software modules. By the end of 2011 it was expected to have all the four demonstrator vehicles equipped with all hardware components and software modules in order to start on-road set-up tests to verify the developed functions in real scenarios before functional tests are conducted.